Prominent & Leading Manufacturer from Coimbatore, we offer solar pumps and solar water pump. 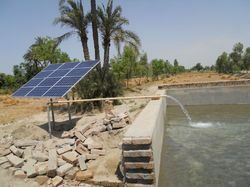 Solar Pumping Systems becomes more and more popular; it can be applied to daily use (underground water), agriculture irrigation, forestry irrigation, desert control, pasture animal husbandry, water supply for islands ,wastewater treatment engineering ,and so on ,In recent years, with the promotion of the utilization of new energy resources, solar pumping systems are more and more used in municipal engineering ,city centre squares, parks tourist, sites, resort and hotels, the landscapes and fountain systems in the residential areas, This system is composed of a solar array, a pump, and a solar pumping inverter. Based on the design philosophy that it is better to store water than electricity, there is no energy storing device such as store battery in the system. We are offering a wide range of Solar water pump. We obligated to meet the quality standards as per the customer demand.